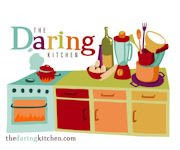 Audax Artifex: THE DARING COOKS’ JULY, 2012 CHALLENGE: Cooking "En Papillote"
THE DARING COOKS’ JULY, 2012 CHALLENGE: Cooking "En Papillote"
Blog-checking lines: Our July 2012 Daring Cooks’ host was Sarah from All Our Fingers in the Pie! Sarah challenges us to learn a new cooking technique called “Cooking En Papillote” which is French and translates to “cooking in parchment”. What a wonderful challenge I love technique challenge where we learn a new technique and have to apply it, this method of cooking I have not done very often so it's good to experiment for the challenge. After some thought and having a look in my freezer I decided on some seafood . I really haven't done this type of cooking before, so I was excited to experiment with some ideas I had while I was reading the challenge write-up. For my first effort I remember a long while ago I had a marvellous dish at a dinner party so I tried to replicate it for this posting. 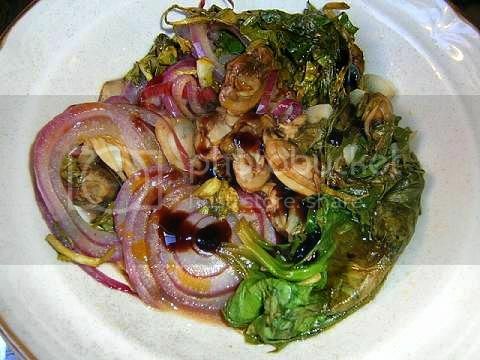 The basic dish is sweet clams with spicy peppery greens, chilli, red onions and garlic. It is most important that the vegetables and clams are just cooked that is delicate, soft, tender and aromatic with bright vibrant colours and flavours. And that the flavours are well balanced with a combination of spicy, sour, salty and sweet, the sauce is a mixture of clam juice (released during cooking), extra virgin olive oil, balsamic glaze. 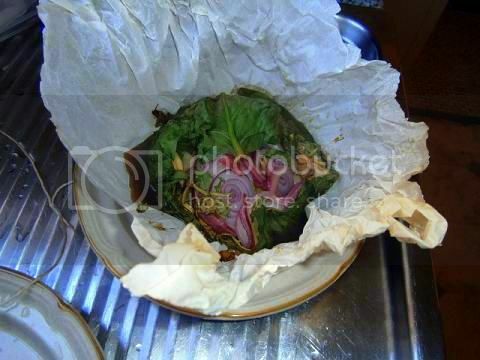 The parchment paper parcel all tied-up with twine this is a photo after the cooking process notice the browned paper and the amount of liquid given off by the clams and vegetables. 1. Preheat oven to hot 220°C/425°F/gas mark 7. 2. Cut four 8"x8" (20cmx20cm) parchment paper squares. 3. Combine the oil and the vinegar together in a small bowl. 4. Line each parchment square with large spinach leaves leaving a boarder of about 2" (5cm) all around the paper. 5. 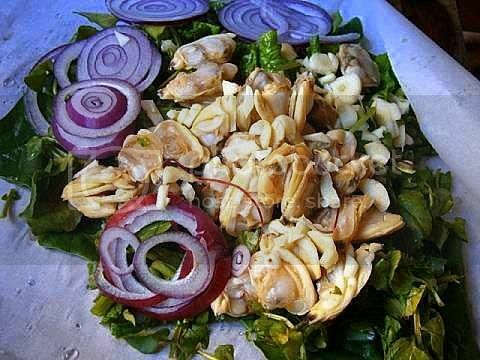 Add a quarter of the chopped greens, chilli, onions then the clams to each parcel, splash a quarter of the oil/vinegar mixture, lemon juice and the peppercorns onto the filling then fold the ingredients over themselves so the clams are in the centre of the parcel. 6. Tie up the parcel as a purse using twine. 7. 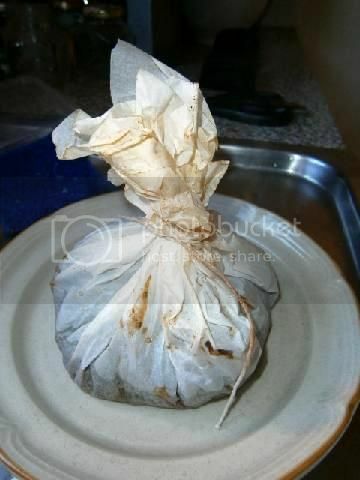 Place the parcels into the hot oven for about 15-20 minutes, check at 10 minutes if you are using fresh clams. You should be able to see through the paper to notice the liquid given off. 8. When the parcel feels hot and the paper is browned it should be ready. 9. Carefully open the parcel so the steam escapes away from you and add a quarter of the balsamic glaze. Verdict - I'm really happy with this recipe I loved how bright and flavoursome the dish was especially the onions, spinach and clams. I think I did a better job on this than the original dish that I remember. Using a lot of watercress really helped emphasize the peppery/chilli flavour profile of the final dish. 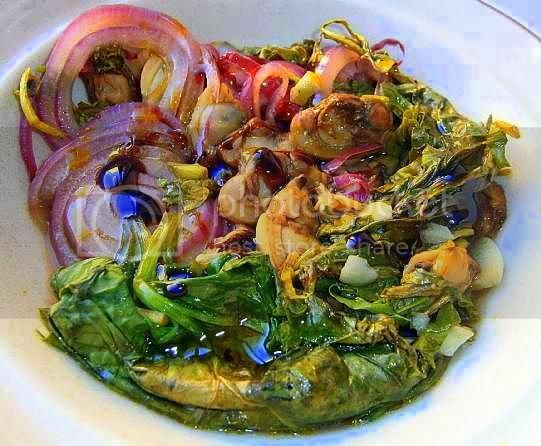 This method of cooking makes for a very sweet seafood and vegetable dish, the onions, clams and spinach were really sweet and soft. Thank you so much Sarah for a most intriguing challenge. Audax - I saw your post on this in the forums and thought it looked really good. Great idea for this challenge! What a great looking dish. The colours are fabulous! As always, your food looks fabulous! I love what you did with it. I may have to try it for myself. Great job per usual! I love the vibrant colors. Wow! What a beautifully vibrant and delicious dish! I had never cooked like this before either, but it was so easy - wasn't it? Love what you did! Great recipe, so colorful, healthy and delicious looking! Love that you chose clams, and what a sweet pairing with the watercress, red onion and spinach. I adore sweetness in a savory dishes! Plus spicyness... These, and of course your colorful pictures, are screeming to me to make it right away. Thanks for the great recipe idea!